"Strength by itself is not equal to knowledge and knowledge is not equal to training, but combine knowledge with training, and one will acquire true strength"
From the Tiger, we learn the positive qualities of knowing ourselves and our abilities, how to prepare to reach our goals, the importance of patience and discipline, and how to proceed with our plans when we know the time is right, despite obstacles and our own fear. gain a solid understanding of the basic blocks, kicks and punches (based on fundamental Taekwondo techniques) that will form the foundation for further learning. Each technique learned is like a brick in building a foundation of a house, with each move and lesson supporting each other. acquire an understanding of your body through training and an awareness of the power that you possess. Only through training will you know this power - you may not be exposed to it otherwise. Taekwondo training is your chance to understand your body in this way. experience increased stamina and improvement in your physical conditioning - encouraging you to maintain a healthier lifestyle and a new way of living! Regardless of physical ability, any individual can benefit from Taekwondo. 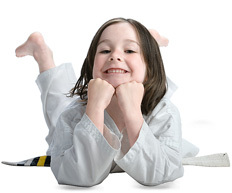 Tiger Taekwondo teaches School Programs in Edmonton and Leduc, from Elementary to Senior High School students.